The pronunciation is NECK-row-tize-ing fash-e-I-tis, and it means decaying skin. It is a bacterial infection caused commonly by group A Strep bacteria, which is the same bacteria that causes common Strep throat. Usually easily killed by antibiotics, sometimes a very strong variety of Strep occurs. 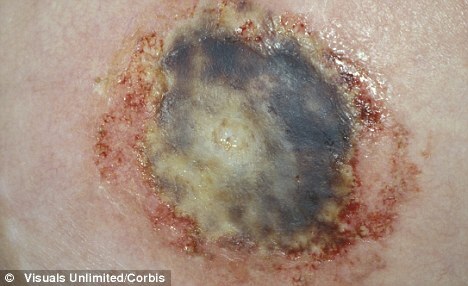 This is the one that causes the life-threatening cases and is known as the "flesh-eating" bacteria. 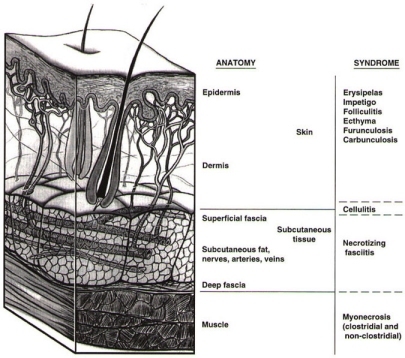 NF can also be caused by other bacteria, or a mixture of bacteria. The bacteria destroys soft tissue at the subcutaneous level, and often is coupled with toxic shock syndrome, both are deadly alone, together they are even more so. 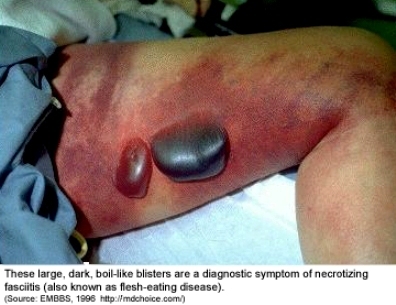 If muscle is destroyed, it is necrotizing myositis. 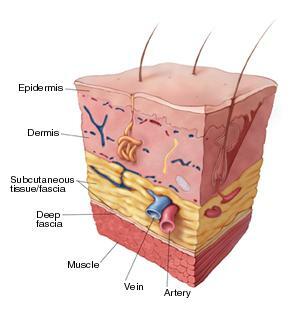 Most often the bacteria enter the body through an opening in the skin, quite often a very minor opening, even as small as a paper cut, a staple puncture, or a pin prick. It can also enter through weakened skin, like a bruise, blister, or abrasion. It can also happen following a major trauma or surgery, and in some cases there appears to be no identifiable point of entry. It is most commonly transferred by respiratory droplets or direct contact with secretions of someone carrying Strep A. For instance, a person carrying a Strep A bacteria might not even show symptoms or become ill at all. They cough or sneeze, another person picks up the bacteria on their hands or directly at the point of a wound and the infection occurs. 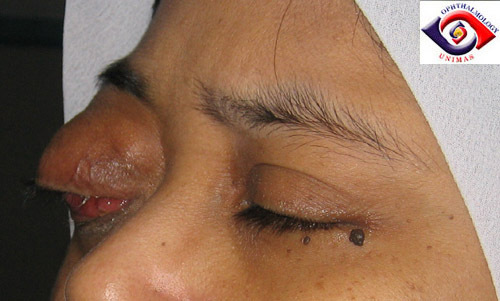 The NF patient is not likely to be contagious, and inanimate objects are unlikely to be points of transmission. It can't necessarily be prevented, but you can lessen your chances with some basic hygienic practices. Buy anti-bacterial soap and use it! From the offensive standpoint, cover your mouth when you cough or sneeze, throw away tissues, wash hands frequently. You could be the carrier and not know it. Fifteen to thirty per cent of the population carries Strep A at any given time usually with no symptoms. From a defensive standpoint: wash hands frequently, avoid contact with persons showing sore throat symptoms. Clean and care for even the smallest traumas, using an antibiotic ointment and sterile covering with frequent changes. 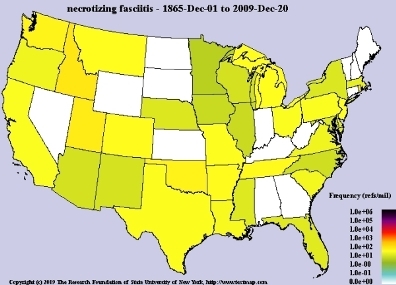 Necrotizing fasciitis is a extremely RARE EVENT. 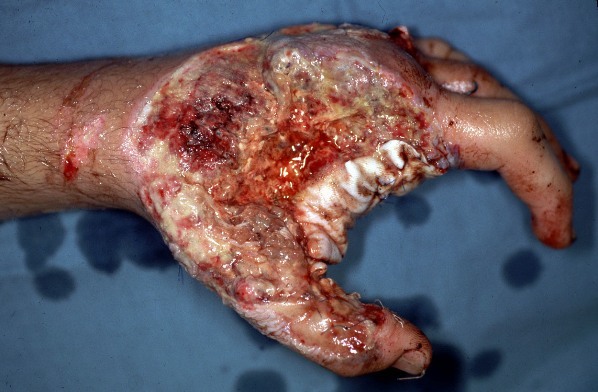 Your chances of getting the Flesh Eating Bacterial is VERY LOW no matter where you live, whether in the United States, England, Canada, or any other country.